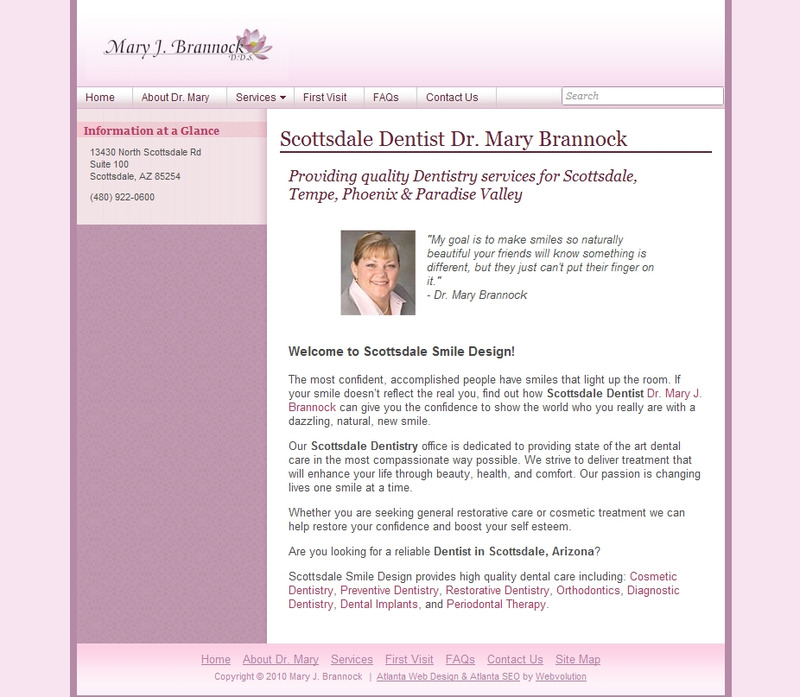 WEBVOLUTION DESIGNS ATLANTA WEB DESIGN COMPANY DEVELOPED A NEW WEBSITE FOR SCOTTSDALE, ARIZ., DENTIST DR. MARY BRANNOCK, DDS. THE NEW WEBSITE LAUNCHED JANUARY 12, 2011. 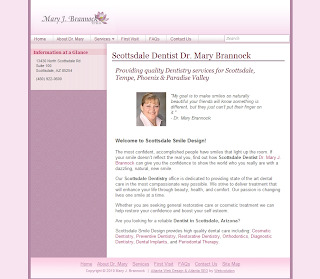 The new Scottsdale Dentist website, developed by Webvolution on the Exponent Content Management System platform for easy on-going content maintenance, features pages for each of Dr. Brannock’s dentistry services, detailed information on what to expect during a new patient’s first visit, Dr. Brannock's Curriculum Vitae and answers to frequently asked questions about dentistry. Dr. Brannock, DDS opened her Scottsdale Dentist office in 1998 after graduating with honors from the University of Oklahoma in 1997. Dr. Brannock is a member of Omicron Kappa Upsilon (the National Dental Honor Society), The American Dental Association, The Arizona Dental Association, and The Academy of Cosmetic Dentistry. She is also a past board member of the Phoenix Esthetic Study Club, a group of dentists in the Phoenix area highly trained in the art of esthetic dentistry. For more information on Scottsdale Smile Design visit http://www.scottsdalesmiledesigns.com or call (480) 922-0600. For more information on SEO Web Design Tips contact Webvolution Designs at (404) 953-2406.